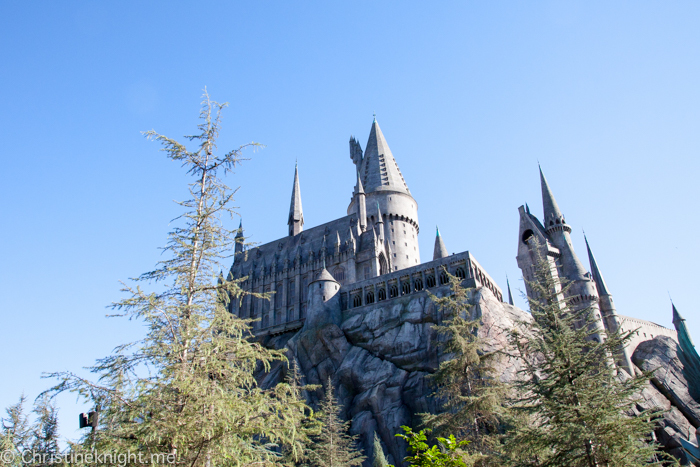 Top Tips For Visiting Universal Studios Hollywood - Adventure, baby! 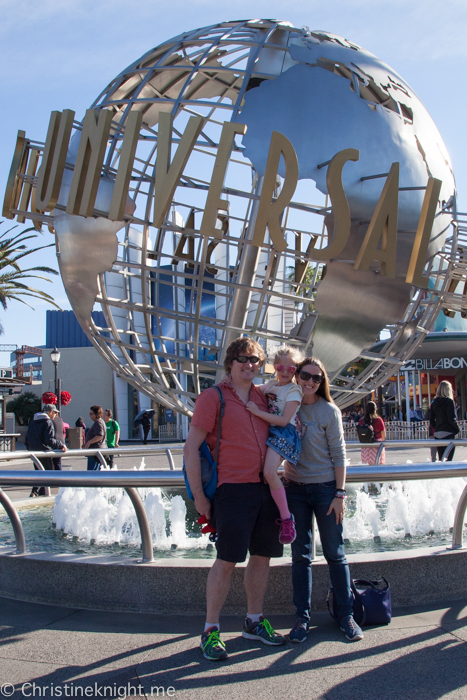 Universal Studios Hollywood is an absolute must when visiting Los Angeles. 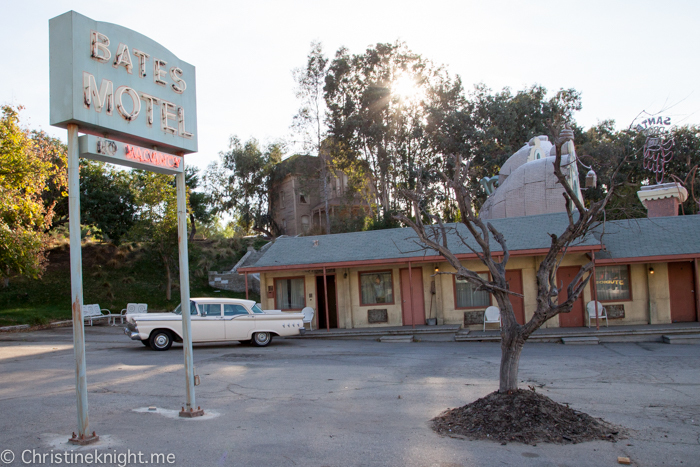 It’s the place where movies are made and dreams come true! 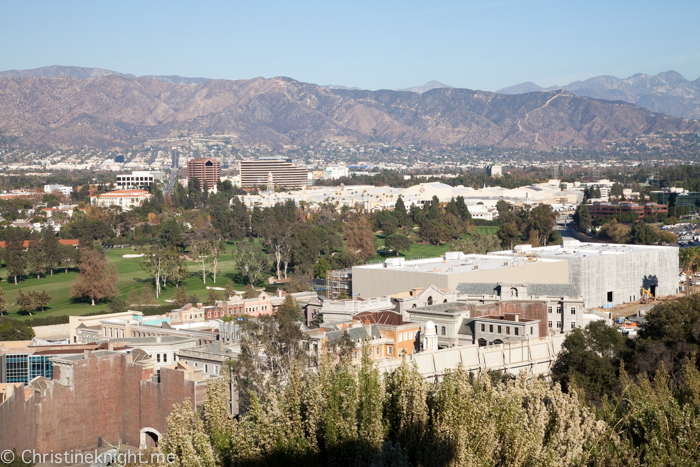 This is the original Universal Studios and home of the Backlot Tour, where visitors are taken around the “back lot” to see the real sets where blockbusters are made. 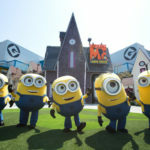 Universal Studios Hollywood is the only one in the world where this attractions is on offer. If you’re visiting the park, these tips will help you make your day a fun and successful outing that the whole family will remember for years to come. This is always something I do as it saves an extra step at every place we visit. You can buy your tickets online here. Tickets cost different amounts depending on the time of year that you go. Busier times of year cost more. 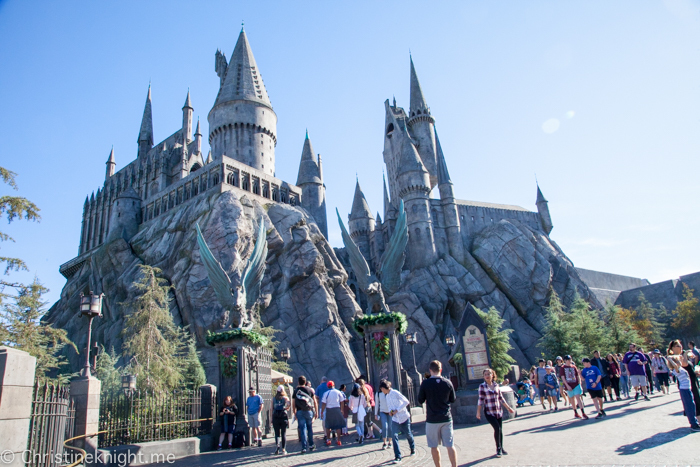 Buy your tickets online at http://www.UniversalStudiosHollywood.com for early park access to The Wizarding World of Harry Potter™ (see details here). 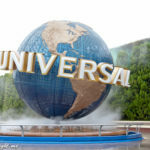 if you’re visiting during busy periods, consider upgrading your ticket to a Universal Express Ticket. 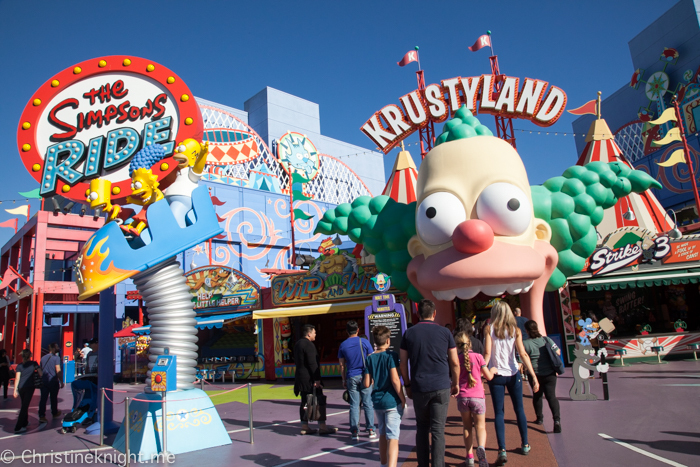 This gives you one-time express entry to attractions and priority seating at shows. 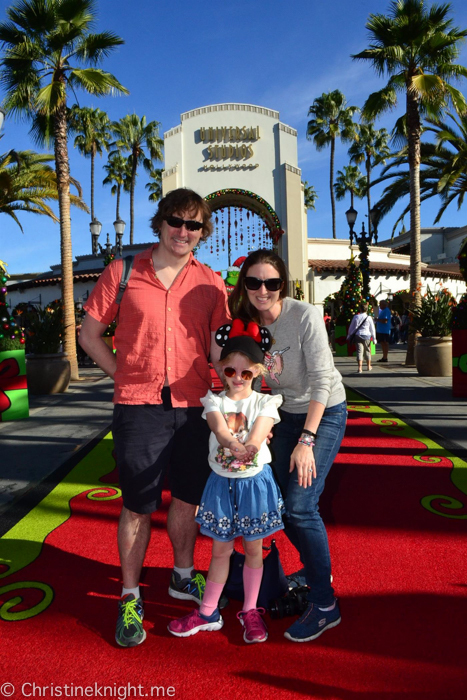 We visited on a busy Saturday in December and found the pass to be an excellent time saver. 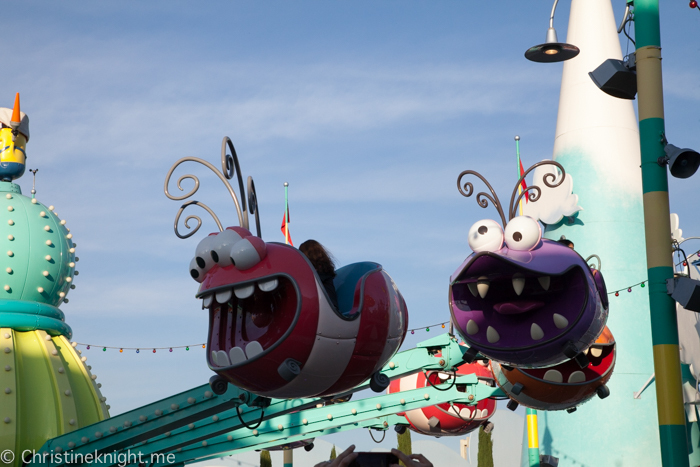 Note: You can only use the express pass ONCE per ride/ attraction. 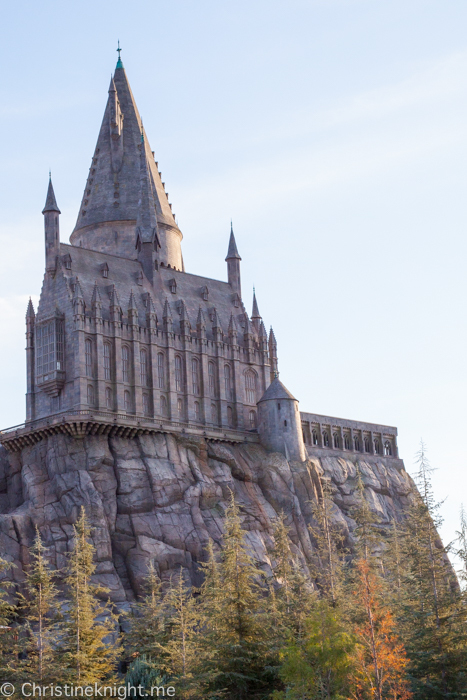 The Universal Studios app is particularly helpful with showtimes, ride wait times and character appearances, plus you can also plan a basic itinerary for yourself in it and leave yourself a reminder for where you parked your car! Download the app here. 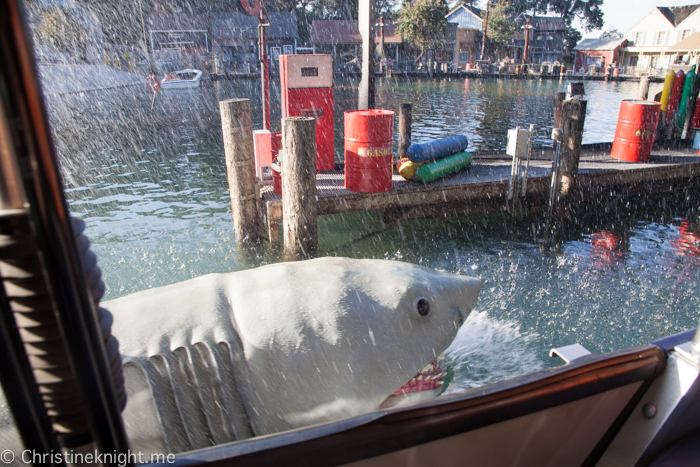 This is my number one tip for any theme park. Always arrive as early as possible! 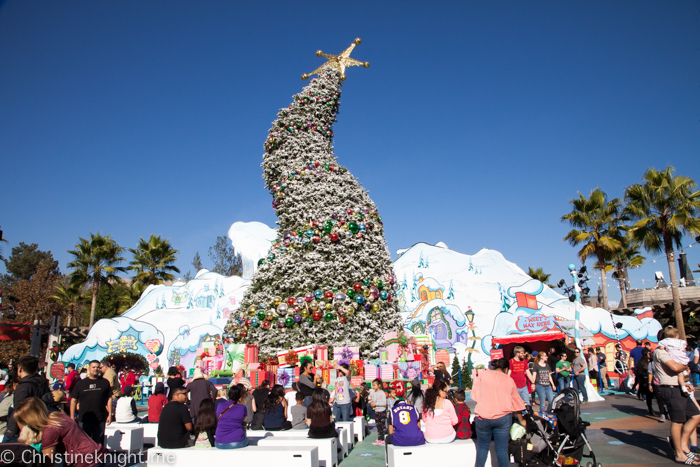 Check the calendar for park hours here. 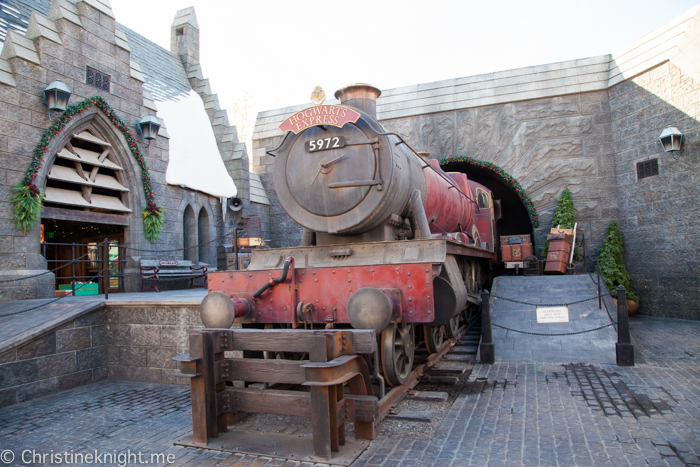 Universal Studios is easily reached by train or you can drive. There is ample parking but it will cost you from $20 per day. 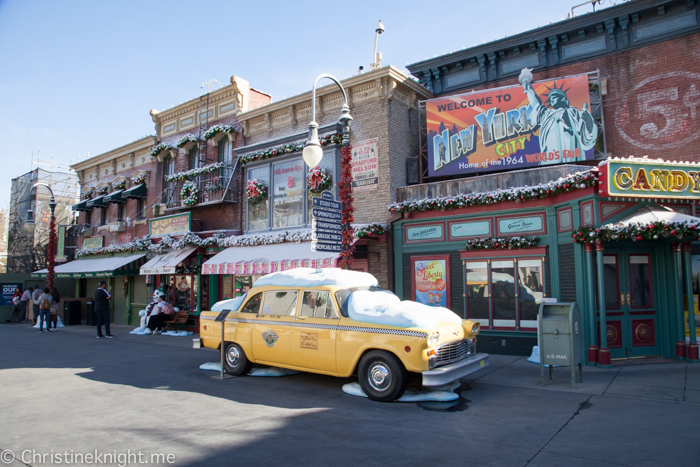 The Studio Backlot Tour is a must-see when visiting Universal Studios Hollywood. 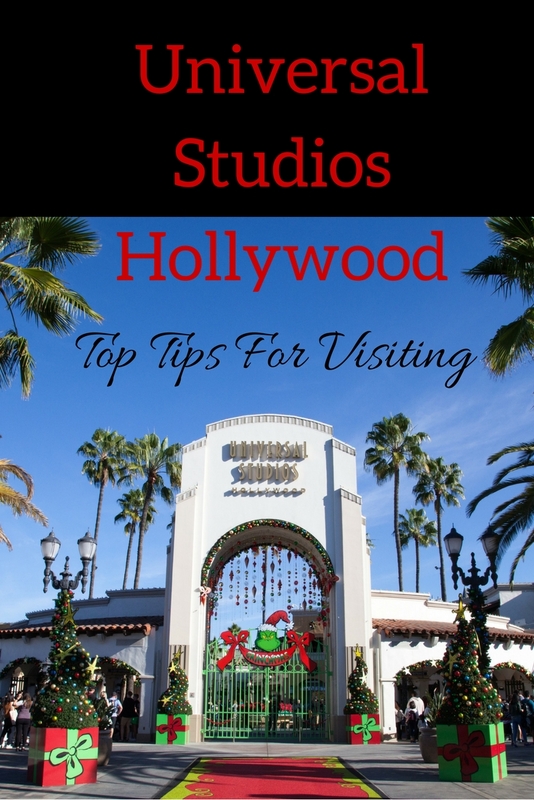 It takes you behind the scenes of the historic studio where many famous movies and TV shows are filmed. The tour takes an hour so budget plenty of time for it. 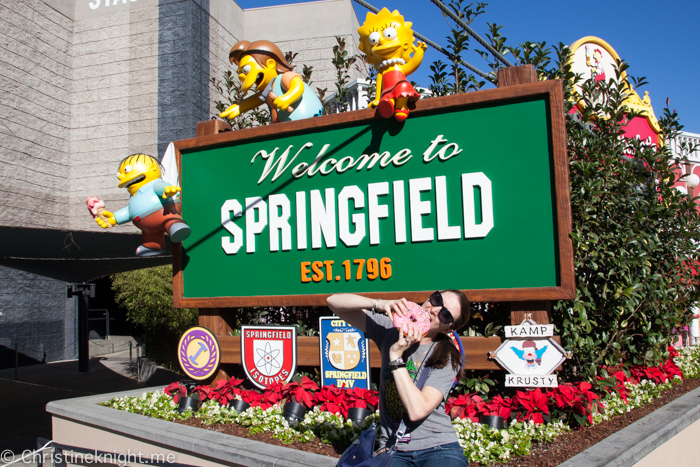 You are allowed to take food and drink on the tour. 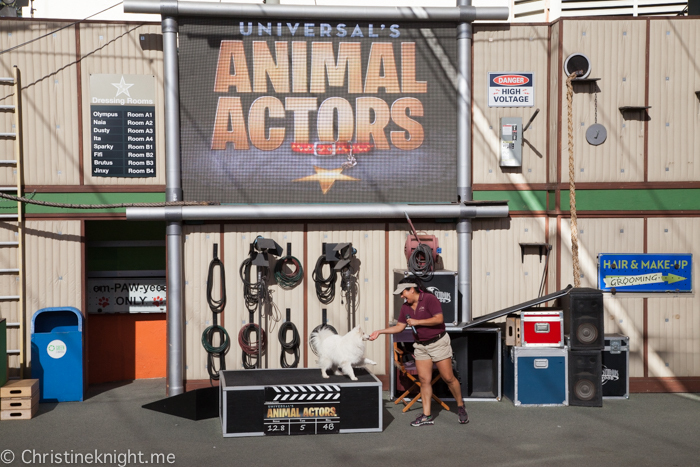 The Studio Backlot Tour is exclusive to Universal Studios Hollywood, so you won’t see it at any other Universal Studios in the world. The park is divided into the Upper Lot and Lower Lot. It takes several escalators and a good 10 minutes or more to get between the two, so factor this into your planning. 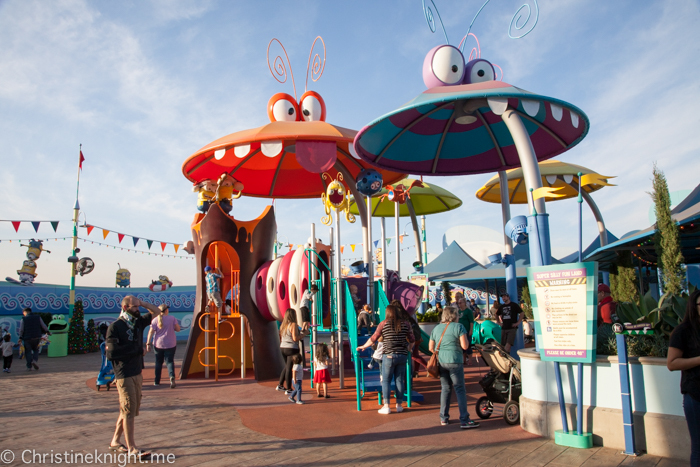 The Lower Lot opens an hour after the Upper Lot. There are lockers inside the park entrance as well as dotted around the park to store your belongings all day. You can also rent strollers and wheelchairs if needed. Make your day easier by keeping your hands free and companions comfortable. If your phone doesn’t have the power to last all day, you can borrow a charger from Guest Relations or plug in your own charger at Starbucks. 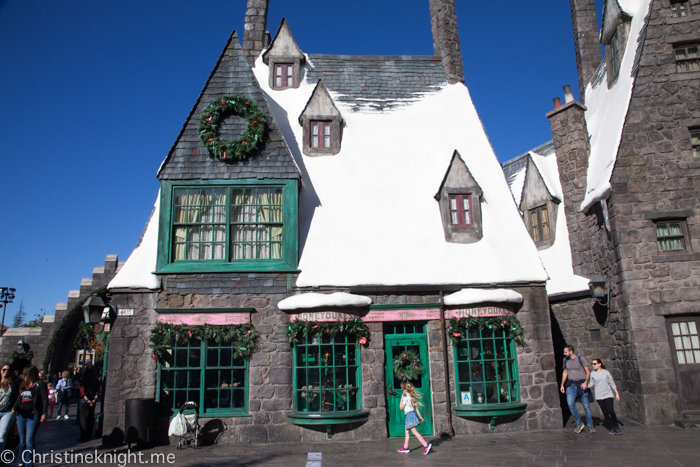 We really enjoyed the giant donuts in the Simpson’s themed land, and had the best theme park meal we’ve possibly ever had at the Three Broomsticks restaurant in the Wizarding World of Harry Potter. 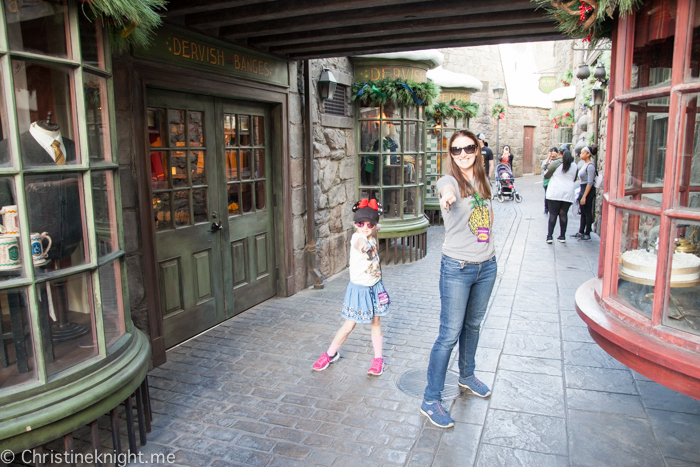 We also loved the frozen Butterbeer! 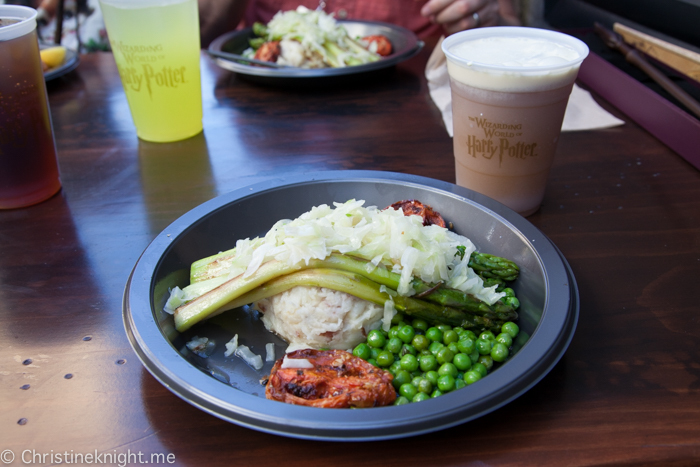 I really appreciated that Universal Studios has a link on their website that details all of the park’s vegetarian options! 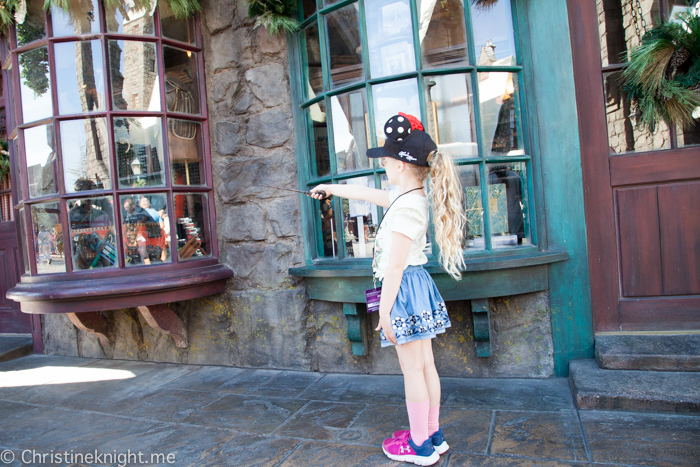 We bought the special wands that allow wizards to perform “spells” around Hogsmede. 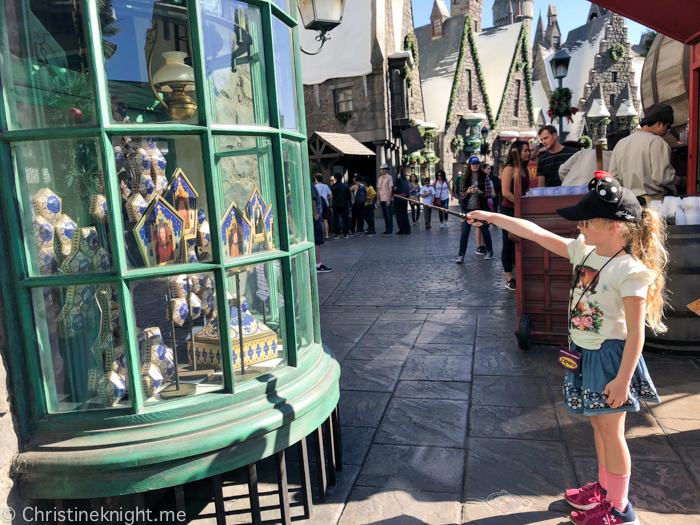 They were pricey souvenirs (around $45 for non-interactive resin wands and $60 for interactive wands), but well worth it for us as this is where we spent the majority of our time at Universal Studios Hollywood. 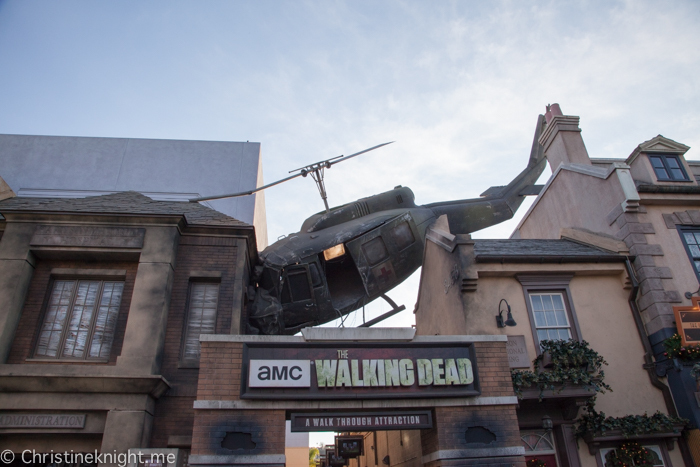 A second attraction that is exclusive to Universal Studios Hollywood is “The Walking Dead”. 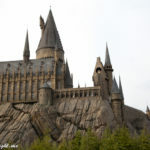 Due to its intense nature, it’s not recommended for guests under the age of 13, but older teens and adults will enjoy some the authentic make-up effects, detailed costuming and set design, plus and sophisticated (read: scary!) animatronic walkers. 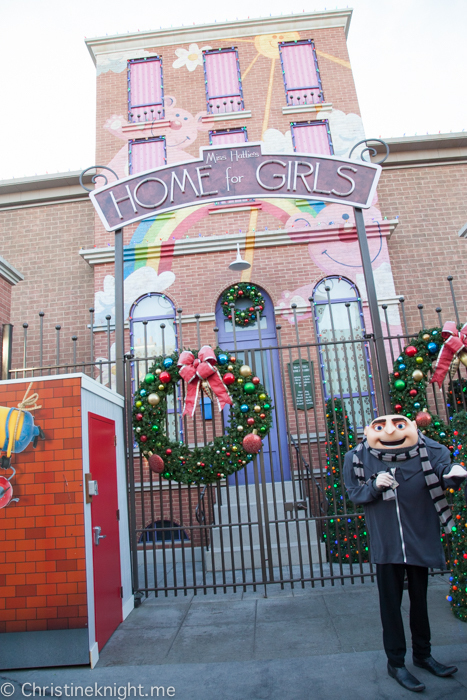 The majority of rides at Universal Studios Hollywood are aimed at older kids and adults. 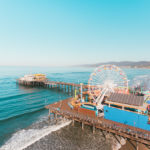 While there is plenty to entertain littler kids, you should check that your child is big enough for the rides if that is your prime motivation for going. 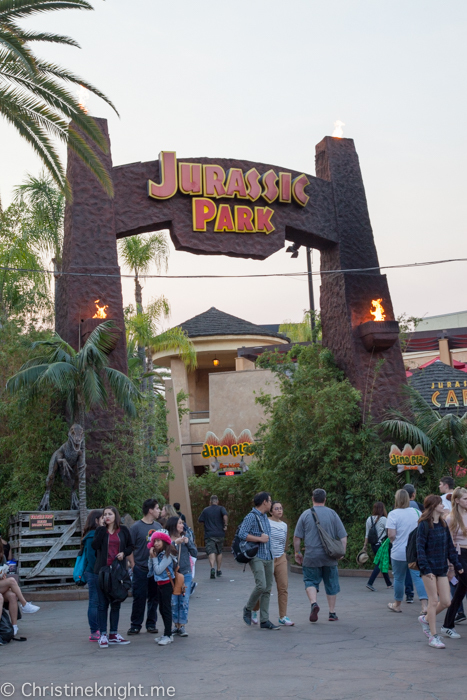 Jurassic Park® — The Ride: Must be 42″ (107 cm) tall. If your kids aren’t big enough for the rides you want to go on, use the “child switch” program. One or more of your party goes on the ride while the rest can wait with the kids who are too small in the attraction’s Child Switch room. 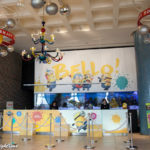 When the party returns, they switch with those who were waiting with the kids, without having to wait in line again. I find the live shows to be great fun, as well as pretty kid-friendly. 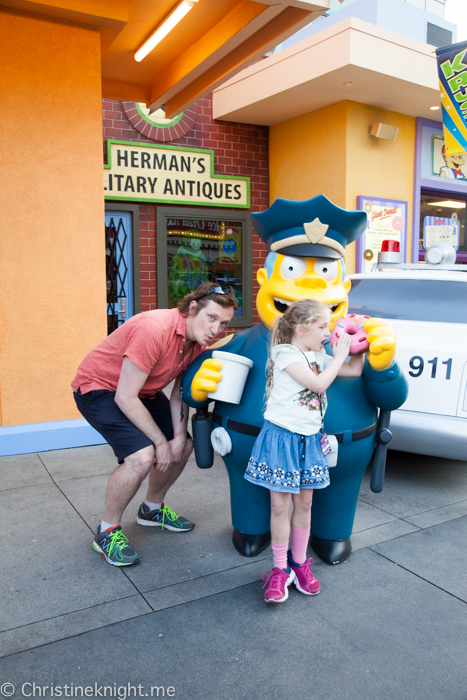 They’re a great way to get into the spirit of movies in-between rides. 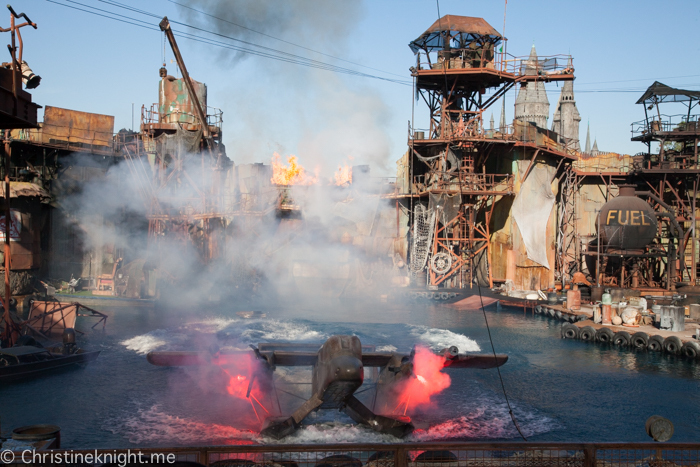 My 6-year-old loved the Animal Actors and WaterWorld shows in particular. The Special Effects show had a few too many monsters for the little one, but was incredibly interesting for the older kids and adults in the audience. 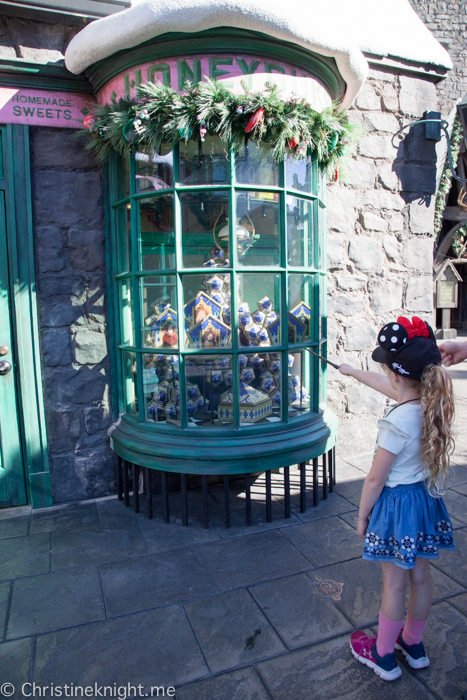 The wand selection show in Ollivanders at the Wizarding World of Harry Potter is really fun (and a bit magic!). 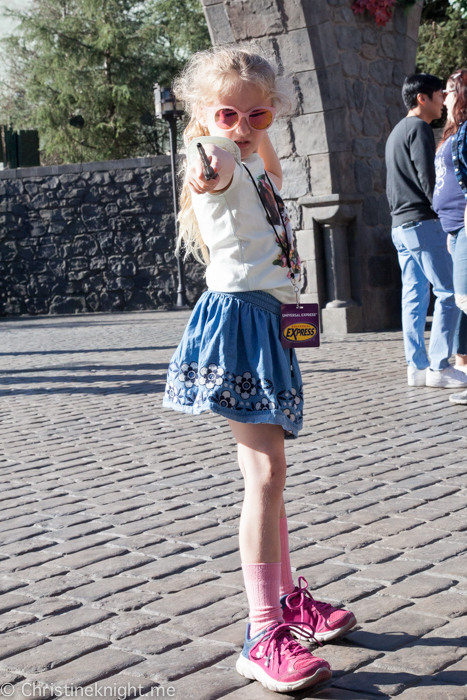 If you’re lucky, you might get chosen in the show to find your perfect wand (and keep it!). 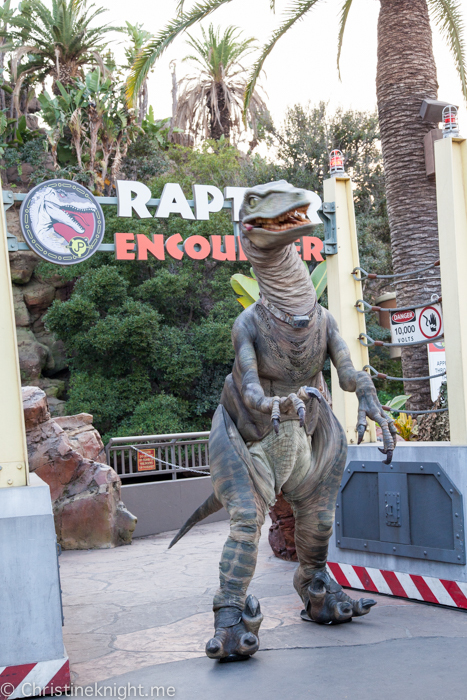 In the Lower Lot, the Raptor Encounter out the front of the Jurassic Park ride was also a lot of fun, even if the raptor was deemed “too scary” to get too close. 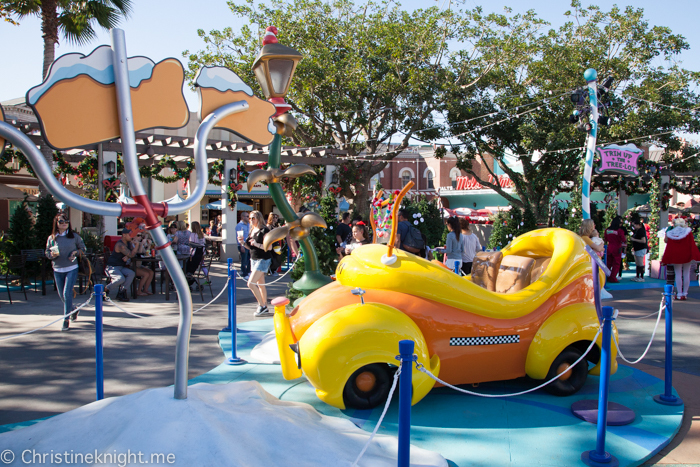 We were lucky enough to visit just before Christmastime and enjoyed seeing the park at its most festive. 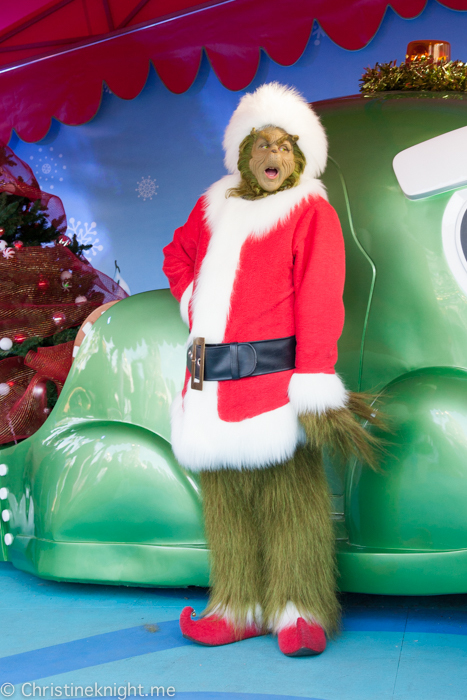 In the centre of the park there is a special “Grinchmas” set up, with a huge Suess-themed Christmas tree that looks stunning at night when it’s lit up, as well as all-day live, family-friendly entertainment and photo opportunities with the Grinch himself. 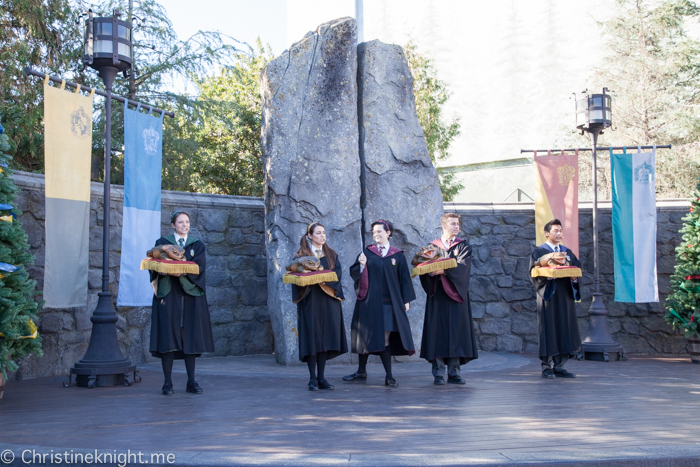 The Wizarding World of Harry Potter is also excellent to visit at this time of year, with the Frog Choir singing a special Christmas tune and a spectacular evening light show on Hogwarts Castle. 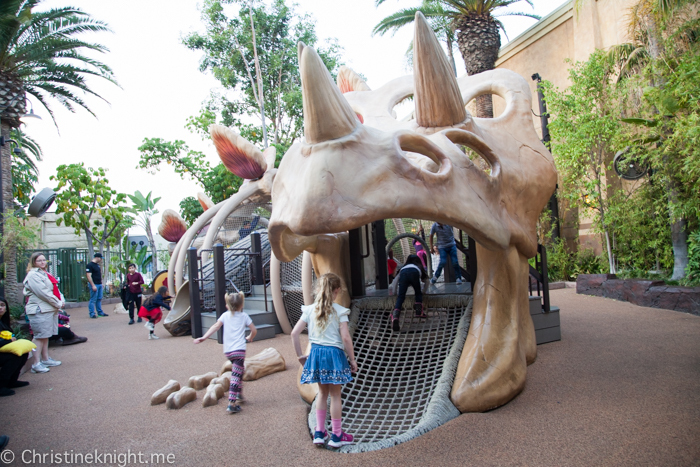 The Upper and Lower Lots both have designated play areas for little kids aged 5 and under. 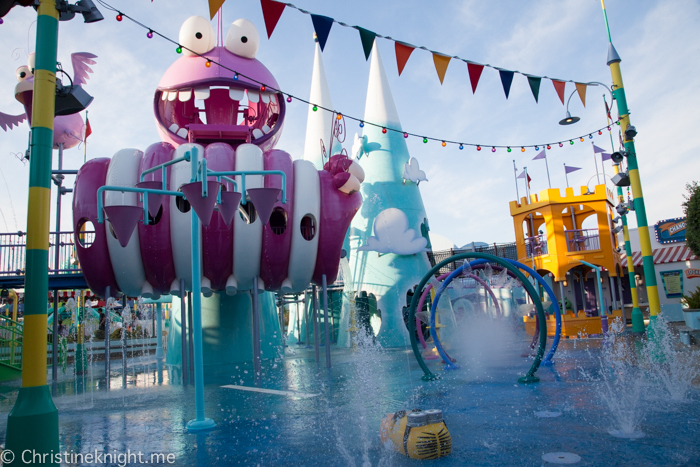 The Upper Lot area is water-themed so take swimmers if it’s a hot day, while the Lower Lot area is dinosaur themed and next to the Jurassic Park ride. 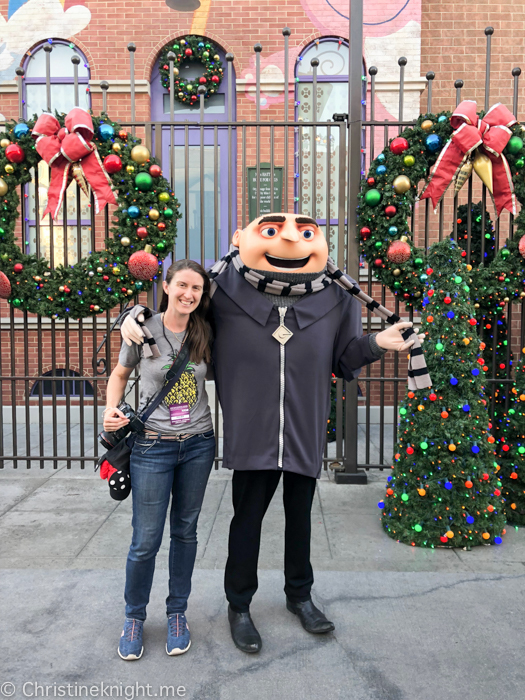 I love meeting the characters – you’re never too old! 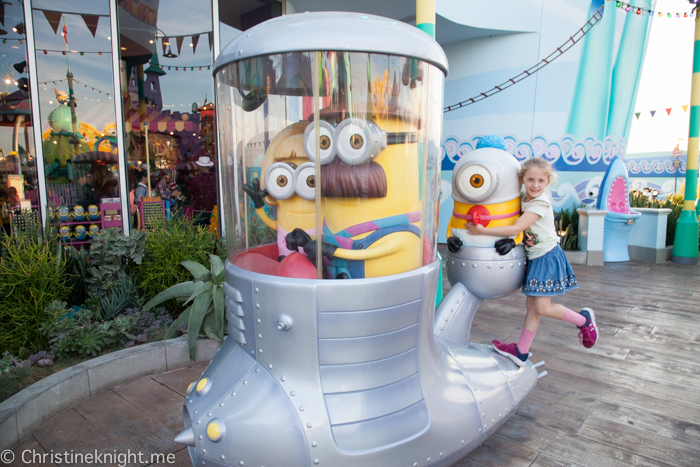 I particularly enjoyed seeing the characters from Shrek, Madagascar and Minions while at Universal Studios Hollywood.